In June I traveled to Michigan from Pittsburgh, PA to try and see one of the rarest warblers in the USA, the Kirtland's Warbler. At one point in 1987 there were only 167 singing male Kirtland's Warblers in their range, less than 400 birds. The birds were placed on the endangered species list and a massive effort was started to understand what was happening and to devise ways to fix it. It was discovered that there was a one-two punch affecting the birds. 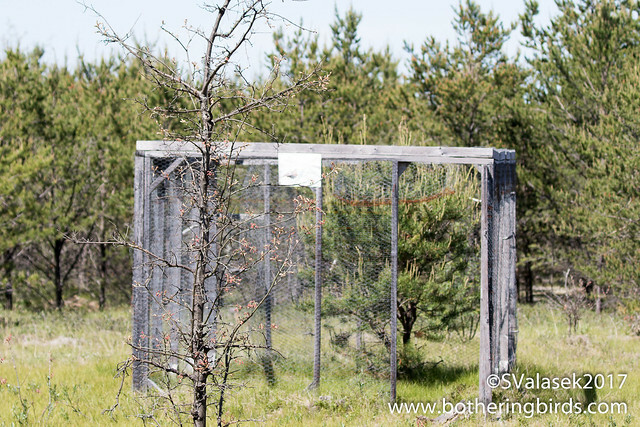 They need a specific environment to nest in, on the ground beneath young Jack Pine trees, and they were being taken advantage of by Brown-Headed Cowbirds, a nest parasite. The Jack Pines use fire to help reproduce. They keep branches long past the point that they dry out and become kindling and they also have pine cones that open with heat to release seeds. Fire burns everything in the area and only Jack Pines are left to sprout in the now fertile soil. But in modern times there were too many people living in the northern lower peninsula of Michigan that fires were not safe. 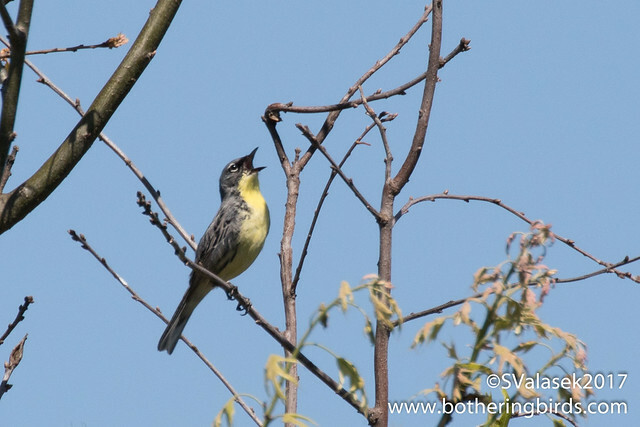 Today, through active and intense forest management as well as capturing of Brown-Headed Cowbirds, the population of Kirtland's Warblers have recovered to the point that there are over 3000 singing males. To be honest, I had no idea about any of this prior to the spring of 2017. But after I found out about their history, I had to try and see them. Fortunately for me, Michigan Audubon leads tours in the summer to known nesting areas. I made my way to Hartwick Pines State Park near Grayling Michigan, right in the middle of the mitten. I camped at the park and met up with the tour in a really nice visitor's center in the park. As we were waiting we could hear Ovenbirds calling from the parking lot and watched as Rose-Breasted and Evening Grosbeaks visited some feeders. After a short talk about the history of the Warblers we all drove off in caravan to a stand of young Jack Pines east of the park (no Kirtland's breed in the park itself, it's mainly White Pine and deciduous trees). We left the paved road and followed a dirt 2-track into the trees. It was a bit eerie to see the trees all 12-15 feet high with taller Aspens sprinkled in. We were told to listen for the call of the Kirtland's and then look for a gray and yellow bird singing. 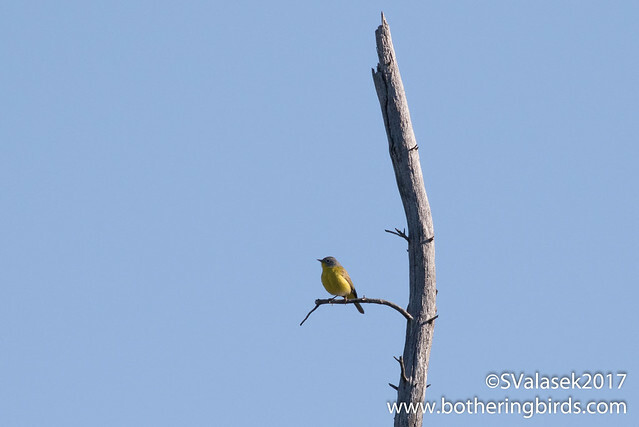 Shortly after our walk someone did see a grey and yellow bird sitting on a snag, but it was just a lowly Nashville Warbler (but a lifer for me!). 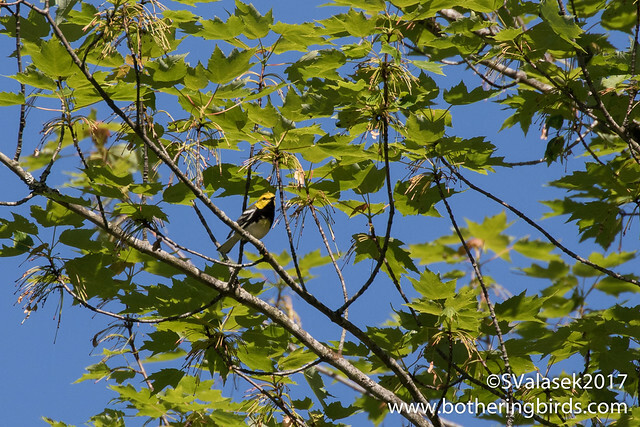 We continued on into the trees quietly listening for the Kirtland's. Suddenly a warbler with a yellow breast was right there along the road. 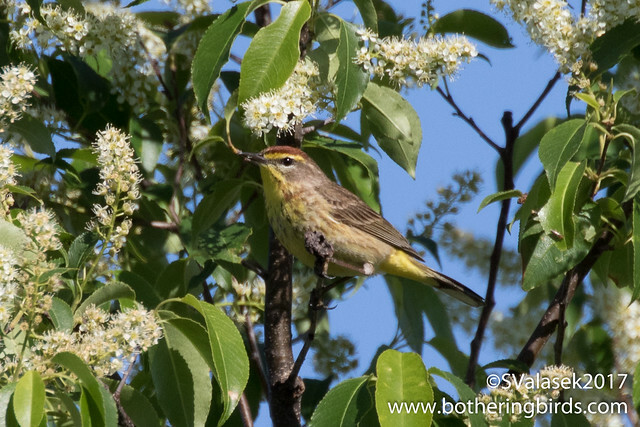 Those of use with cameras snapped away... but this time it was a beautiful Palm Warbler. Once again we ventured on. Another hundred or so yards down the road someone heard the rising and then falling tones of the Kirtland's Warbler. It was coming from far off and the looks were really poor. Then all of a sudden another call, this time right near the group, but behind some really small trees. And then another bird singing from the opposite side of the road, they seemed to be all around us. 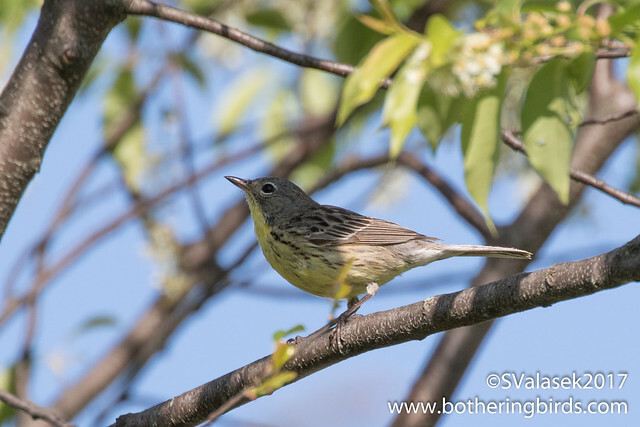 I was fortunate enough to see a female Kirtland's Warbler. These birds are very shy and typically stay out of sight on the ground. 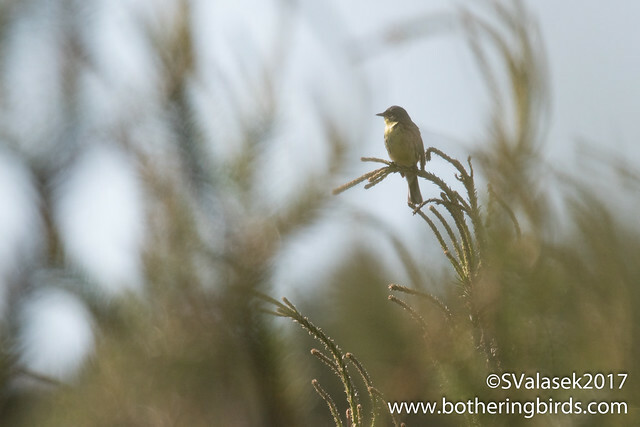 It's the males that sing up high and why the census of their population given in singing males. 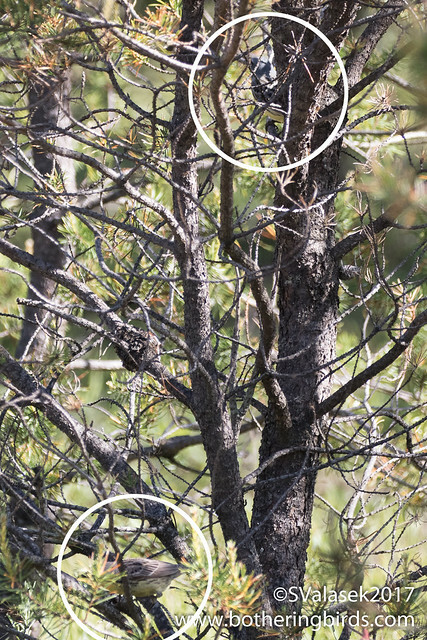 You can see the duller female in the bottom circle compared the brighter male above. I was so excited to get to see these birds and to get such great looks as I did. Some trips go out and fail to see any of the birds. The group returned to the main road and we all went on our separate ways. I ventured west and found some more lifer warblers along a great stretch of road. The next day, on my way back to Ohio, I stopped at a nearby location where some Upland Sandpipers had been seen. I found another stand of Jack Pines and wandered around looking at all of the power lines for sandpiper shapes. 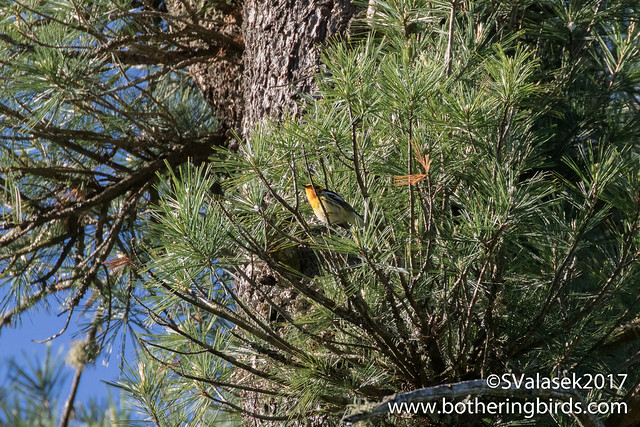 But not more than 300 yards into the woods I heard the now familiar call of another Kirtland's Warbler. I would hazard a guess that if you ventured into any young looking Jack-Pine trees in the area of Grayling and listen carefully, you'll hear and then see some Kirtland's. And if you need another sign, look out for these cowbird traps along the way. If you do make the trip to Hartwick Pines SP, take the time to walk around the various trails. 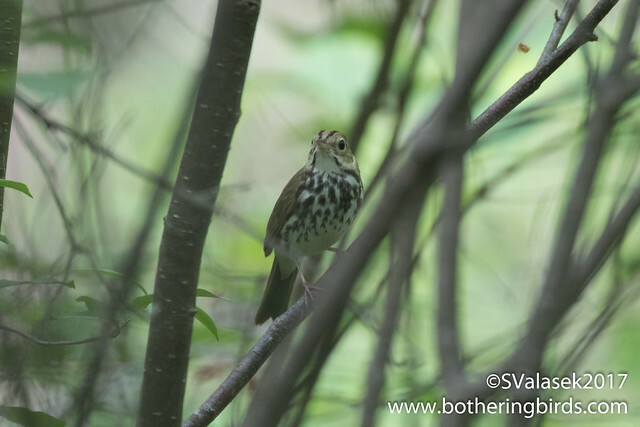 They were full of Ovenbirds, Blackburnian and Black-Throated Green Warblers. If you do make the trip, take advantage of the free tours from Michigan Audubon. 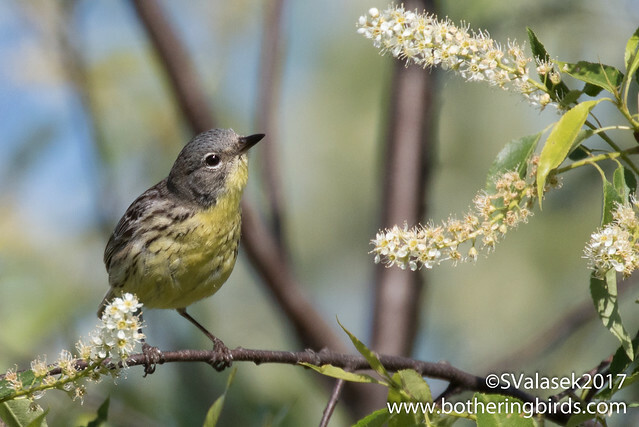 Or attend the Kirtland's Warbler Weekend the first full weekend in June.